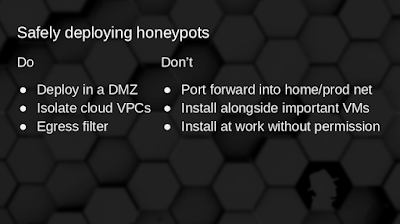 I've been thinking about honeypots a lot over the last year. I have a bunch of Raspberry Pi, Atheros-powered boards, old Linksys routers and other devices kicking around my home office that would make good honeypots, and my thoughts always wander back to wishing I could easily consolidate the logs from an army of diverse honeypots to a central location for reporting. That's what initially drew me to MHN -- despite development being pretty much stalled for the past 2 years save for minor fixes here and there. It's kind of a shame, really, the state of blight attained by the once-vibrant intel-sharing honeypot-loving ecosystem. There are a couple of active projects (telnetlogger and cowrie among my favorites) but hpfriends vanished, and most of the popular honeypot projects haven't seen but a fistful of commits in years. The STIX/TAXII ecosystem always seems like it's in a state of flux for anyone outside of FS-ISAC. All the while, there seems to be this undertone of something big coming with regards to open sharing of threat information among the incident response crowd. For all their warts, some honeypots and analysis tools still work pretty well. I started putting together a presentation for SecKC shortly after beginning my tinkering with MHN, and those slides can be found here. 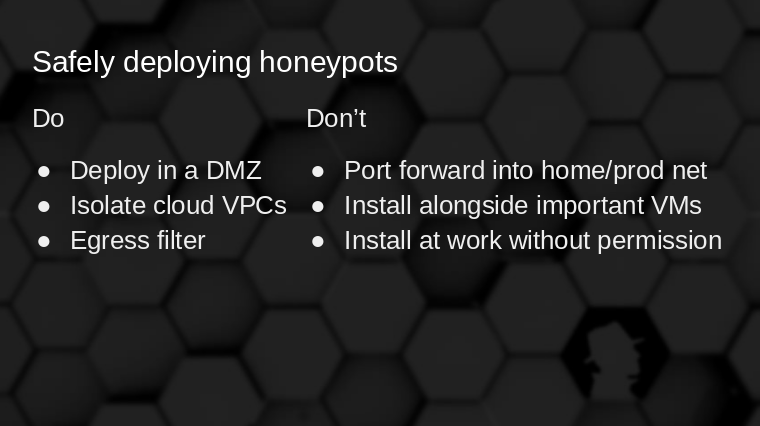 This post is more of a walk-through of setting up and managing MHN and honeypots than the presentation was. The instructions on the MHN github page work well. I installed MHN using a vanilla EC2 Ubuntu AMI on a t2.micro (free tier) instance without any trouble, but as we added more honeypots to it, a bump up to t2.small was needed to keep it from running out of memory on a daily basis, and I'm still not sure how well that will scale. A few members of the SecKC community have set up almost 50 honeypots* and pointed them at this instance of MHN. It's logging, at times, more than 100,000 hits per day, and the UI is getting kind of sluggish. MongoDB runs out of memory and requires a restart a few times per week, but I just use a cron script to check it every 5 minutes, and nudge the services if needed. This is a trade-off I'm willing to make. On-demand pricing for t2.small costs about $17 per month, and moving up to t2.medium or r3.large (where it probably belongs, due to MongoDB being a pig) sets me up for a monthly Amazon bill of $35-124, which I don't feel like shelling out of my own pocket. When you add users to the web UI, they are all admins. Admins can disable other user accounts. This is kind of a pain. I recommend installing the sqlite3 package on your MHN instance if you end up adding more users. I'll cover MHN databases toward the end. Additionally, I think all users can edit deploy scripts and delete honeypots, even if they're not admins. Be careful who you give access to the MHN console. I'd recommend disabling the feed of data back to ThreatStream/Anomali (as found in the MHN setup page) by running "sudo /opt/mhn/scripts/disable_collector.sh" after you get it installed. In fact, I also removed /etc/supervisor/conf.d/mhn-collector.conf entirely, then ran "sudo supervisorctl reload" to update the configuration. I'd mentioned the Mnemosyne WebAPI earlier. It requires TLS in order to work properly, and runs on port 8181. If you don't have certs, it won't even try to start. You don't really need to worry about this unless you want to run some custom reports against Mnemosyne outside of MongoDB, such as with some Python scripts.You should probably use your Lets Encrypt certs for this. Symlinks will keep these duplicates up-to-date as certbot rotates your certificates. If you're using this feature from outside of the Amazon VPC MHN resides in, make sure you adjust your Amazon security groups to allow access to this service, but I would not recommend you expose this port publicly. There is some good API documentation here. This isn't what drew me to MHN, but it's a feature I've come to love, and being written in shell (and sometimes a bit of Python), it's stuff that I'm actually comfortable editing. Since some honeypot projects went dormant before MHN, some of the deploy scripts still work fine. A few just need tweaks for minor changes in the host OS (e.g. Ubuntu 16.04LTS switched to the systemd init). In cases like Cowrie, though, the honeypot has evolved far beyond what it looked like when the deploy scripts were created. I've been adjusting a few of these and submitting pull requests, but you could also use my MHN fork for the time being, or simply pick and choose some of the deploy scripts out of my fork, and manually update your MHN instances that way. Here's a quick animation of a Conpot (SCADA honeypot) deployment on EC2. It ran in just a few minutes. Most of the scripts take a little longer on a Raspberry Pi -- particularly the old 600MHz single-core Model B. Just as a honeypot can publish to a channel, it's possible to set up a subscription to these channels. If you connect to HPFeeds with a tool like hpfeed-client from the python hpfeeds package, you can watch in near-real-time as attacks happen. Assuming you have network connectivity, a valid identifier, secret key and permission to subscribe to a channel, you can run the client from anywhere, and it'll pull the feed that MHN is getting. In the below example, I'm only querying dionaea.connections and cowrie.sessions. No dionaea connections showed up in the few seconds I had the client running, however. $ python env/bin/add_user.py test s3cr3t "" "wordpot.events,amun.events,cowrie.sessions,shockpot.events,dionaea.connections,snort.alerts"
The output should look like this, as sessions start rolling in (it can take a while if your honeypots sit idle a lot. You can do quite a bit with just the HPFeeds data stream, for instance, if you funnel it into a database with some shell scripts, or run some post-processing on the HPFeeds log with awk. I have done a lot of testing over the past 2 months. Some of the deploy scripts needed some work (see above) but a lot of packages still run fine. Here are the ones I recommend. Note that Cowrie and Kippo deployments will move your real SSH server to port 2222, so be prepared for that. For Raspberry Pi, installing the most recent image of Raspbian Jessie Lite from an image is probably your best bet, though the full Raspbian/PIXEL installation, from an image or from NOOBS also works fine on the Pi2 and Pi3. Most of my testing was done with the old-school Pi Model B and low-capacity SD cards (2 and 4GB). On the Pi, Cowrie, Dionaea and ShockPot are my favorites. WordPot also runs well, but you need to choose between it and ShockPot if you want something versatile on HTTP, and WordPot uses more resources. ConPot installs and runs properly, but it seemingly reports every single HTTP connection as an attack, which is noisy and counter-intuitive in my opinion. Kippo works, but cowrie does it better. Amun works, but it's got a lot of overlap with Dionaea, which seems to provide more details about attacks in the logs. 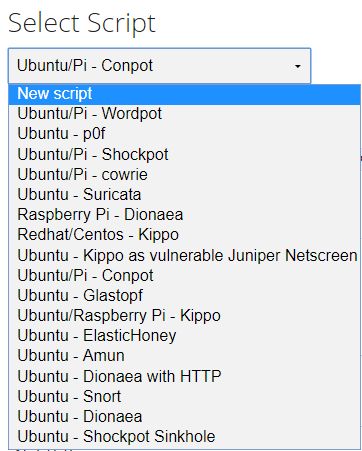 On Ubuntu 16.04 LTS, my picks are Cowrie, Amun and WordPot. If you have a lot of RAM to spare, add Snort to the instance as well, because it will report all kinds of things that trigger an IDS signature from the EmergingThreats rule repository. Snort takes some manual configuration changes after install. ShockPot works, but as with the Pi, you can really only run one HTTP honeypot. ConPot works, but it's noisy. Kippo works, but Cowrie is better. Dionaea is broken for 16.04, hence my recommendation of Amun. 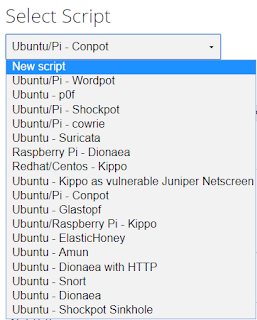 I've spun up a bunch of Ubuntu honeypots with Cowrie, Amun, WordPot and Snort all running on the same instance in EC2 and Google Compute Engine. Confirmed broken on Ubuntu 16.04: Suricata and Glastopf. I haven't invested much time in fixing these, but Glastopf seems to rely on ancient version of PHP that's (thankfully) missing from the package repository, and I'm not 100% sure what Suricata's deal is yet, but it looks to be something that can be fixed in the config file without much of a problem. I've found the MHN web front-end to be a bit lacking aside from the most basic of reports, and as I'd mentioned earlier, there's a problem when you add users through the web UI. There are 2 database servers used by MHN, sqlite and mongodb. The majority of the MHN metadata is in sqlite. Use the ".tables" and ".schema [tablename]" commands to explore MHN's sqlite database, if you get curious. The tables user, roles_users are the most useful. All of the deploy scripts are stored in sqlite as well. They're imported from the shell scripts in the git repository upon installation and the scripts in /opt/mhn/scripts/deploy_* are never referenced again. Here are a couple of useful example queries I've come up with. Find records for IP addresses that start with "192.168"
Brandon from SecKC and I collaborated on this fun dashboard, based on Rob Scanlon's Tron Legacy Encom Boardroom visualization. Brandon did all the code tweaks and wrote the middleware to get data into it. I just played project manager once the MHN firehose was ready. It really is a sight to behold. The "satellites" are approximate geo-locations for the deployed honeypots. Push-pins on the globe are attackers. The center pane is a live feed of attacks, with usernames and passwords where applicable. The right pane is a top attacker list and a map (if you click on the attacker) with more details. The chart at the bottom is the last 24 hours of attacks. Some of the panels won't display data unless you're logged in to avoid sharing the honeypot IPs publicly -- we're working on tweaking the back-end so that it can work well, safely, without authentication.